Spilling or leaking hydraulic fluid onto a porous concrete driveway can result in unsightly stains. 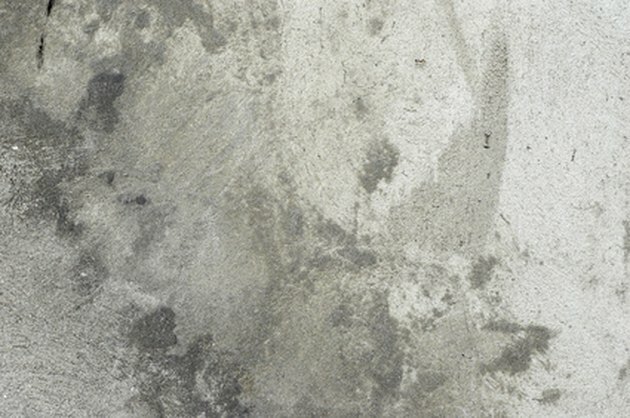 Concrete driveways have rough finishes to prevent slipperiness, but they also allow oil to absorb quickly. Try to treat the stain as soon as possible with dish soap and water. If you miss it and it has had time to set, try the poultice method. Concrete stains look sloppy. Clean them up! Apply dish soap to a fresh stain. 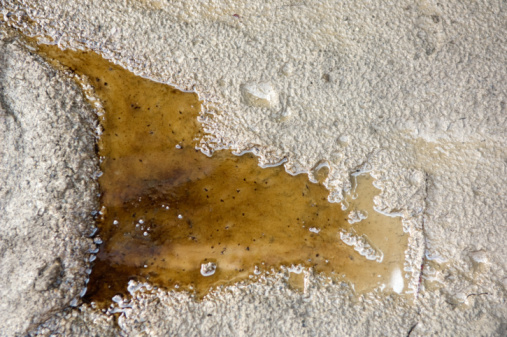 Squirt the area with water and wet the surrounding area to prevent the oil you remove from causing a secondary stain. Scrub the area vigorously with a nylon-bristle or natural-bristle brush. Scrub until you have a rich, thick lather. Sprinkle cat litter on the soapy area, let it dry and dispose of it properly in a certified landfill. Hydraulic fluid and other motor oils are toxic to people and the environment, so make a quick phone call to your trash collector and find out where you should dispose of it. Dissolve 22 ounces of trisodium phosphate (TSP) in a bucket containing one gallon of water. Add enough finely ground calcium carbonate and mix with a hand trowel to make a thick paste. Spread the poultice over the stain with a trowel and allow it to sit for a day. Apply when there is no rain in the forecast. Brush off the paste with a stiff-bristled brush and collect the dried paste for proper disposal. Rinse and scrub the area with clean water.